ESP SWITCH REMOVED FROM A 2010 AUDI A3. THEY ARE TESTED PRIOR TO DISPATCH. WE WILL DO OUR BEST TO RESOLVE THE ISSUE. Highlands and Islands - extra. Make sure you are buying the correct item as it is your responsibility to make sure the part you are buying will fit your vehicle. AUDI A2 HEADLIGHT SWITCH THIS SWITCH WILL FIT AUDI A2 AS YOU CAN SEE THE ITEM HAS NO WEAR OR MARKS AND IS IN PERFECT CONDITION AND WORKING ORDER . Free uk post . Part number - 8P19621075PR 8P1962107. Model - A3 8P. AUDI A4 CABRIOLET 2003-2009 CONVERTIBLE ROOF SWITCH. Cash on collection in person. Be sure to add Nirro to your favourites list ! OS is offside, right, or drivers side in the UK. IN ALL CASES WE STATE THE CONDITION OF OUR PARTS. From audi a3 2003 8p1 3 door. RS6 - 2008-2011. Q7 - 2006-2014. A3 - 2004-2010. A6 - 2005-2011. Window Switch Button. PART NUMBER: 8P2941531C. AUDI A3 S3 '05-'11. (PART NUMBER: 8H0959851C. Donor Vehicle: AUDI A4 B7 2006. 7) gaskets, sealants and any bolt on ancillary is not covered by our warranty. example, head gasket is not covered. this is a wear and tear item. FOR YEARS: 2012, 2013, 2014, 2015, 2016, 2017, 2018 (2014). MON - FRI 9AM-6PM. OUR REF: 1451-06031916122278. Audi A4 B6 B7 Dash Blank Centre Right. Donor Car: 2006 Audi A4 B7 Saloon 2500cc Sport. The New and Used Audi Parts Specialist for all Audi models worldwide. Audi Part Number: 8E2 941 516. It may fit others. LIGHT SWITCH REMOVED FROM A 2007 AUDI A4 B7. Make sure you are buying the correct item as it is your responsibility to make sure the part you are buying will fit your vehicle. (3) Security marks are not visible/removed. Fits for Audi A6 C6 Q7 4F0959851F. 1 Window Switch. Made by original specification, directly replace the old one, match perfectly. Color: Black. Part Number: 4F0959851F. Material: ABS. Audi TT Mk1 180 225 8N Heater A/C Switch Control Button Dial Cover. Condition is Used. Dispatched with Royal Mail 1st Class. Genuine Audi part fully working no returns Prefer cash on collection Can offer next day post if required, please ask before buying. International post may differ from quoted price, message with your address for an accurate postal quotation. Part Numbers: 8P0953513. Stalk combination unit. Donor vehicle: Audi A3 2.0 tdi, BKD 140bhp / S-Line. Genuine OEM part remain of highest quality and durability. This part will not fix your car in miraculous plug and play way! NS is Nearside, Left, or the passenger side in the UK. OS is offside, right, or drivers side in the UK. All Parts have been checked and are in good working order. Cash on collection in person. IN ALL CASES WE STATE THE CONDITION OF OUR PARTS. Audi Q3 8U 2011-2018 Wiper Indicator Cruise Control Stalk Stalks 8X0953502B. Condition is Used. Dispatched with Royal Mail 1st Class. FOR YEARS: 2009, 2010, 2011, 2012, 2013, 2014, 2015, 2016, 2017 (2015). Audi Breakers. Gearboxes must be filled with new oil upon installation. All engines & gearboxes will usually be drained of all fluids for carriage. New listingGenuine Audi TT Mk1 226 180 Heated Seat Switch 8N0963563B . 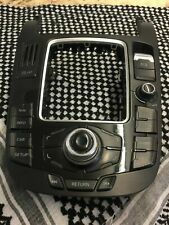 Hello and welcome to my listing for this Genuine Audi TT Mk1 226 180 Heated Seat Switch 8N0963563B. This part is in good condition and perfect working order. Any questions please feel free to ask. Many other Audi TT parts are available check out my other listings. Thanks for looking and happy eBaying. Item: WIPER STALK. Make: Audi. (Part Number: 8H0959851B. Donor Vehicle: AUDI A4 B6 CONVERTIBLE 2005. 7) gaskets, sealants and any bolt on ancillary is not covered by our warranty. example, head gasket is not covered. this is a wear and tear item. PART NUMBER: 8N2 941 531 A. AUDI TT MK1 8N HEADLIGHT SWITCH. PART NO: 4B0962109A. Suitable for many cars .